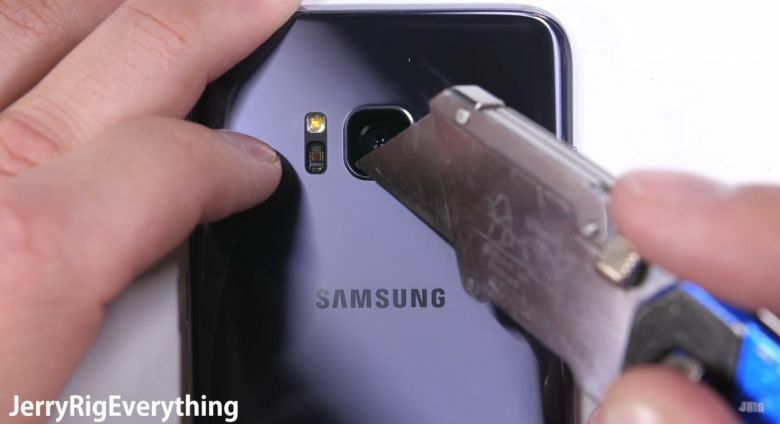 The age of easily bent high-end smartphones is thankfully behind us, and Samsung never failed such a test anyway, so it’s hardly surprising to see the spanking new Galaxy S8 remain perfectly firm and stiff as professional gadget destroyer Zack from YouTube channel JerryRigEverything tries his best to flex the “Infinity Display” flagship at least a little bit. What’s remarkable about this sleek phone is just how incredibly well-built it is all in all, with virtually no weak spots. You can fast forward to the end of the vicious durability review video, and check out a few years’ worth of extreme abuse summed up in a few minutes leaving only artificial scars and minimal cosmetic damage. Nothing beneath the surface, really, despite three consecutive 30-second flame rounds, plus all the typical scratching of every nook and cranny, sensors, buttons, speakers, cameras, frames, rings and so on. There’s absolutely no doubt in our minds now that the Samsung Galaxy S8 (and, presumably, its big brother) will gracefully survive the test of time, as well as the beginning of an apocalypse, at the very least. You can of course scratch, burn and generally damage this bad boy if you really put your mind to it, but otherwise, you’re probably safe without any sort of protective cover needed. Until you inevitably drop it on its face, in which case Gorilla Glass 5 technology can’t do much to shield you from harm.